Since April of 1978, the Clinton Street Theater in Portland has been doing the Time Warp. Yes, they've been showing the cult-classic, "Rocky Horror Picture Show" for over 30 years now. As far as I can tell, that's the longest run of RHPS in the world! Every Saturday night, fans show up to 2522 SE Clinton Street in full-costume, props in hand and ready to shout back at the screen as the dialogue moves along and the songs are sung. Believe me, you haven't ever experienced anything like going to the midnight showing at the Clinton Street Theater. It's a lot of fun and you'll more than likely feel a blush coming on at quite a few of the happenings there. Get the Rocky Horror Picture Show on Blu-Ray! I'm sure that's the reason that I lost one of my girlfriends. I dragged her to the midnight showing and proceeded to serenade her with some of the movie's more "colorful" songs. It seemed to seal my fate with her! haha. That was in my wilder days. 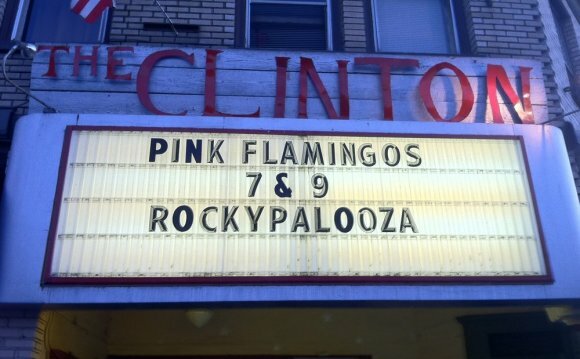 Aside from the following of RHPS, the Clinton Street Theater is also well known for underground and independent films. You're sure to catch some really different stuff showing there. It's not at all a present-day multi-plex with 40 theaters inside. The Clinton Street in Portland Oregon is a single screen movie house that first opened it's doors in 1915. It's quite a treat inside for older movie house fanatics. It's all very nostalgic looking. No one under 21 is allowed in after 7 pm, unless you're there for the Rocky Horror Picture Show. They only accept cash, so make sure you stop by the ATM before you come. The Rocky Horror Pastie Show says "Thank You Tim Curry"